Balancing Touch Reflexology: Want to become more flexible in 3 minutes? 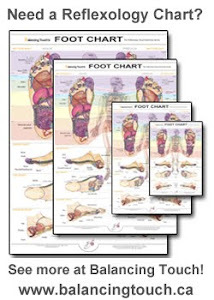 Reflexology Charts, Reflexology Products, and our take on Reflexology. Want to become more flexible in 3 minutes? We'll you can with Reflexology and more specifically Ear reflexology. This is also a cool party trick? Try this simple ear massage to become more flexible and even improve your overall health. Assessment - Look over your right shoulder keeping your shoulders square to the body and pick a spot on the wall that is the furthest you can see, take a mental snap shot. Repeat over the left shoulder. Then bend over without moving your feet and see how close your hands can get to the floor. 2. Stretch in four directions - grab the tip of the ear and pull up, grab the middle of the ear and pull back, grab the ear lobe and pull down, then put your index finder in the ear hole touching that little flap and pull out. Up, back, down and out. Repeat 3 more times. 3. Ear massage - Using your index and thumb massage the entire ear releasing little cracks and crunches you hear. Do this until the ears are red and very warm. The Check Assessment - Repeat the Assessment, look over your right shoulder then left shoulder and then bend over and touch the floor. Most people notice a huge change, they are able to look and bend way farther then they could 3 minutes ago. Some people might experience more suble changes like they might feel more relaxed, clearer mind or even an energy boost. Some people do not notice anything and this is also fine. 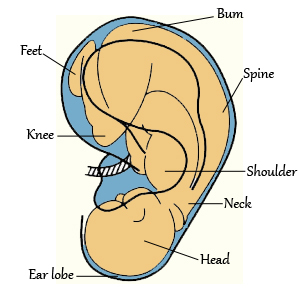 The ears represent the whole human body like a fetus/baby just before it is born (see - Image 1) with the spine on the outside of the ear, the head in the earlobe and the rest of the body on the inside of the ear. So what we worked in the video above was basically the spine and then a quick once over the whole body. This is a great exercise to do right before an exam or if you are stuyding and are feeling a little sleepy this will give you a little energy to pull you through. The ears are also very easy to work ... when at a stop light or waiting for a bus. Enjoy your ears! Here is another interesting ear video I found and wanted to share. 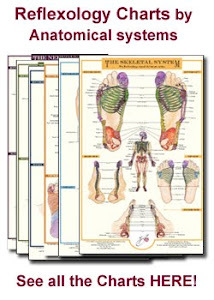 If you are interested in everything to do with Reflexology, join our mailing list and we'll send you up-dates, tips, tricks and new releases on Reflexology products. If you find this is not for you it is very easy to unsubscribe. Also we will never sell, lend or let other people even glance at your information ... It's safe with us. Click on the above picture to learn more. 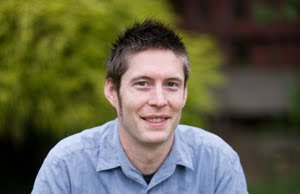 Hello and Welcome: This blog is all about Reflexology and is intended to provide some discoveries that have been personally experienced as I walk through this world with Reflexology as my guide. Copyright 2010 Balancing Touch. Picture Window theme. Theme images by sndrk. Powered by Blogger.